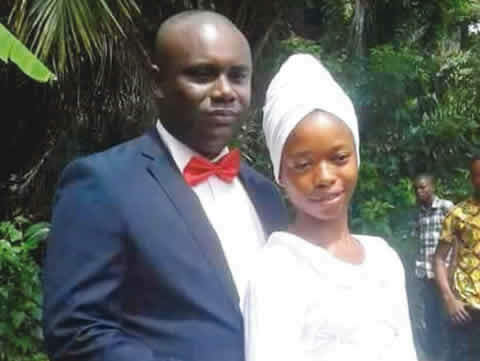 The family of 17-year-old Blessing Udoye has condemned the alleged wedding between her and a man they called ‘stranger’; which was officiated by a pastor of Fishers of Men Charismatic Church, Isiokpo, Imo State. The family claimed that the pastor ordered Blessing not to notify her family members of the wedding until after the marriage. The Punch learnt that the wedding took place at the church’s auditorium on Sunday without any of her family members in attendance. Blessing’s brother, Raphael Udoye, who spoke to The Punch on the telephone, said he got information about the wedding two weeks ago through his sister’s friend, adding that he discarded it. He added that when another friend accused him of not inviting him for Blessing’s wedding and produced the invitation card, he decided to ask his sister about it. He said, “When I got home, I called my sister (Blessing) and asked her about the alleged wedding and she said if I wanted to know I should come to her church for details. “I was shocked because this is the girl I paid her Senior School Certificate Examination fee. “She did not get good grades and I am still trying to persuade her to sit for another exam when it is time or learn a trade. I did not know what she wants is to get married to a stranger. “I called my other siblings to ask if they were aware of any wedding, but they all denied knowledge of it. “When my father got back, I asked him and he was shocked and angry that he summoned my sister to the sitting room where he asked her about the wedding. Raphael, who claimed that investigation showed that the pastor had planned the wedding for about six months ago, said his father visited the pastor and confronted him. He added that the pastor, who did not feel remorseful for his act, said the church had fixed the wedding date and it could not be changed. The Imo State indigene, who noted that Blessing left home days before the wedding, said her phone number had been switched off and her whereabouts was unknown. Raphael, who described the wedding as a taboo, said the family did not accept the husband as their in-law. He added that the family wanted Blessing to go back to school or learn a trade. He said, “I don’t want my sister to get married now, I want her to go back to school; she is still young. The Punch picked a number on the church’s website and the person that picked up the call claimed to be an elder in the church. He said, “We also got the information and we have sent our media team to the village and they will make a report.